Banyan is one of India’s first vertically integrated plastic recycling companies that helps global brands use more recycled plastic instead of virgin plastic. Our proprietary plastic cleaning technology converts collected post consumer and post industrial plastic waste into high quality recycled granules – Better Plastic™ – comparable in quality and performance to virgin plastic. Our award winning data intelligence platform integrates thousands of informal recyclers into our supply chain and also helps cities manage their waste more effectively. Banyan's proprietary plastic cleaning technology removes inks, coatings, and other contaminants using environment friendly detergents and solvents to supply near virgin quality recycled granules to brands, a first in India highly informal, low tech industry. Banyan pioneered closed loop recycling initiatives with India's leading automotive company (making new bumpers from discarded ones) and a global cosmetics company (making new bottles from discarded ones), establishing circular economy leadership in the automotive and beauty sector respectively, that can be extended to other industries. Banyan is one of the first companies in the country to use mobile, cloud and IoT to integrate thousands of informal sector last mile collectors into its supply chain to recover post consumer as well as post industrial plastic waste. The platform has now been extended to help cash-strapped municipalities understand waste flows through their cities and use a data-centric approach to make waste management more efficient, effective, and economical. "Banyan worked with our polymer experts and R&D teams to meet our technical specifications and conduct various engineering trails to ensure that recycled plastic granules meet our safety requirement. The circular awards could serve as a much needed encouragement not just for Banyan for the auto industry to adopt a closed-loop circular economy approach for raw material use." "Banyan has exhibited polymer expertise and engineering expertise in conducting multiple trials to improve the quality of recycled plastics and match our technical specifications. We are also impressed with Banyan's sourcing technology which allows them to source large quantities of post consumer materials from the informal sector." "Banyan's platform (Data Intelligence) has the potential to democratize waste management across the country, empowering cities with critical data and insights to improve collection efficiencies, maximize landfill diversion, and save costs." "With Banyan Nation now beyond the proof-of-concept stage, the company has a strong business case for a circular- economy approach that encourages manufacturers to consider the implications of recyclability and resource conservation. Banyan Nation’s goal – which is aggressive but achievable – is to help transform the way India consumes, recovers, recycles, and views plastic as a resource." Scientific rigor in segregation, washing and extrusion allows Banyan to identify resins with a high degree of accuracy, prevent cross-contamination, eliminate product and packaging contaminants and produce a consistently high quality product. Addition of performance polymers allows Banyan to meet stringent thermal and mechanical properties, a must have in high performance applications such as automotive and consumer electronics. An equal opportunity employer, Banyan provides safe and sanitary working conditions, fair wages, retirement benefits, and health insurance for its workers, setting a high bar for social responsibility, unheard of in a largely informal industry. Stringent adherence to air and water quality indicators mandated by the pollution control board, ensures that Banyan's processes and products do not negatively impact the environment. Design and manufacture sustainable products and packaging with Better Plastic. Make in India sustainably. We offer standard as well as custom grades of recycled compounds for your specific needs. We specialize in recycled resins for consumer packaging, auto components, consumer durables such as furniture, and consumer electronics. Responsibly recycle your discarded plastic with us. It does matter. We work with bulk waste generators and aggregators and accept post consumer and post industrial scrap plastic. For example, post consumer shampoo bottles, auto parts, woven sacks, paint pails, etc. For detailed specifications on resins, quantity and quality write to us or call us directly. Learn more about how we built a technology-driven recycling business that is rooting out inefficiencies in the waste value chain in India. Seasoned business and technology professional. Prior to Banyan, Mani was with Qualcomm Inc. involved in the design, development, testing and commercialization activities of mobile technologies. Mani holds dual MBAs from UC Berkeley (Haas) and Columbia Business Schools, an MS Degree in Electrical Engineering from University of Delaware and a BTech Electrical Engineering from NIT, Warangal. Technologist with global experience. Prior to Banyan, Raj worked at Voltari Corp. building teams, architecting technical solutions, designing, developing, and driving customer experience for $100Million+ products with 10Million+ customers. He holds an MS Degree in Mechanical Engineering from the University of Delaware. Impact investor and strategy consultant. Rashi was previously with Impact Investment Exchange, Intellecap (Impact Investing); Campbell Alliance (Healthcare Strategy Consulting); NERA (Financial Services Consulting) before joining the team of Banyan. She is an MBA from Columbia Business School and holds a BS in Electrical Engineering and BA Economics (dual major) from the University of California, Irvine. 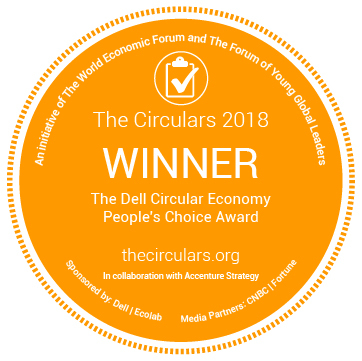 The Circulars, an initiative of the World Economic Forum and the Forum of Young Global Leaders, is the world’s premier circular economy award program. The awards are open to individuals and organizations from commerce and civil society in seven distinct categories and are designed to recognize and celebrate, on a prestigious global stage, all facets of the circular economy movement. The fourth annual iteration of The Circulars was held at the World Economic Forum Annual Meeting in Davos on 22nd of January 2018 where Banyan won the People's Choice award. Thank you for voting for us. We at Banyan are trying to revolutionize waste management in India by building a smart waste management platform with a wide variety of data intelligence capabilities that offer value to all stakeholders. Collaborate with other stakeholders to turn requirements into actionable design and development tasks. Own design and development of the web platform, including configurations and deployments. Use your breadth of skills to participate and influence design discussions across the board. Research and ensure adherence to industry-standard best practices for security and scalability. Support and maintain the web platform during live deployments. 8+ years of software design and development experience. Good programming, debugging and troubleshooting skills. Experience with developing, deploying and maintaining large-scale consumer/enterprise live services. Strong understanding of high-level and low-level – secure and scalable – web API design. Strong sense of ownership and passion for building highly scalable web API platforms. Own design and development of the web frontend for each of the stakeholder roles. Research and ensure adherence to industry-standard best practices for responsive and immersive web user interface design. Ensure adherence to the stipulated localization requirements by using industry-standard best practices. Research and implement best practices for actionable SMS/email notifications to stakeholders. Support and maintain web frontend during live deployments – proactively through telemetry and reactively to bug reports. 5+ years of software design and development experience. Experience with developing web interfaces for data-centric systems. Strong understanding of best practices and patterns for responsive and immersive design. Strong sense of ownership and passion for building user-centric web experiences. Modularized software delivery with room for localization and other customizations. Own design and development of the mobile apps for each of the stakeholder roles. Research and ensure adherence to industry-standard best practices for responsive and immersive mobile app design. Research and implement best practices to prevent data loss due to network connectivity issues. Research and implement best practices for actionable mobile notifications to stakeholders. Support and maintain mobile apps in the field – proactively through telemetry and reactively to bug reports. 3+ years of software design and development experience. Experience with developing Android mobile apps for data-centric systems with strong understanding of internals like memory management, multi-threading, resource caching etc. Strong understanding of best practices and patterns for responsive and immersive app design. Experience with optimizing mobile applications for CPU/memory/battery usage. Good understanding of localization paradigms within mobile apps. Strong sense of ownership and passion for building user-centric low latency mobile apps. collaborate with the data warehousing team to create/modify data schemas. Research and implement industry-standard safe and secure practices to encrypt and encode data in flight. Research network resilience per-device and devise and implement data ingestion protocols for offline use. Support and maintain the devices in live deployment – proactively through telemetry and reactively to bug reports. Experience with heterogenous data ingestion solutions. Working knowledge of network data protocols. Strong understanding of best practices and patterns for safe and secure data transfer. Strong sense of ownership and passion for building an IoT data warehouse. Collaborate with stakeholders on building the visual designs for the web and mobile platform presentation for each of the stakeholder roles within the product. Design mock ups for all form factors for the development team to build on. Review and sign off the fully developed user experiences on both mobile and in browser. Own the UX design during deployment and revise and iterate based on end-user feedback. 5+ years of UX design experience. Good visual design skills with a good understanding of HTML/CSS/JS. Experience with both mobile and HTML5 UX design. Strong understanding of best practices and patterns for immersive and responsive user experiences. Strong sense of ownership and passion for building great user interfaces and experiences. Collaborate with other stakeholders, enumerate scenarios for test and turn them into actionable work items. Own design and development of the in-house test frameworks. Develop automated tests to be part of the CI/CD pipelines. Create bugs and change requests, as necessary, and collaborate with the other stakeholders to drive closure. 5+ years of software testing experience. Good automated test development skills. Experience with UI test frameworks like Selenium, CUIT or PhantomJS. Strong sense of ownership and passion for building secure and user-centric experiences. Collaborate with stakeholders to build the representational schema for all the GIS data being ingested into the platform. Develop the intermediate shim layers to convert the ingested data to align to the schema design. Collaborate with stakeholders to develop trigger-based and rule-based data processing modules for GIS data. Collaborate with UX design team to develop the data representation layers for the GIS data. Research and implement route optimization techniques based on aggregated GIS data. Support and maintain the GIS modules in the platform in live deployment. Hands-on experience with existing geospatial mapping tools like QGIS, MapBox, Carto etc. Hands-on experience with building user interfaces for GIS systems. Hands-on experience with relational databases or NoSQL. Strong sense of ownership and passion for great visual data representation. Please write to us at careers@banyannation.com with your CV if you are interested. © Copyright Banyan Sustainable Waste Management Pvt. Ltd.